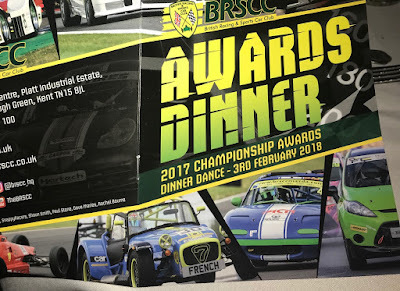 Last night was the 2017 BRSCC Championship Awards Dinner, and I was pleasantly surprised to see my car on the front cover of the event programme. As the BRSCC covers many different championships, there was a lot of awards to give away! About half way through the evening, it was my turn and Peter Daly the chairman of the BRSCC presented me with my plaque. The Commemorative plaque I received for becoming the 2017 Caterham Academy (green group) champion.